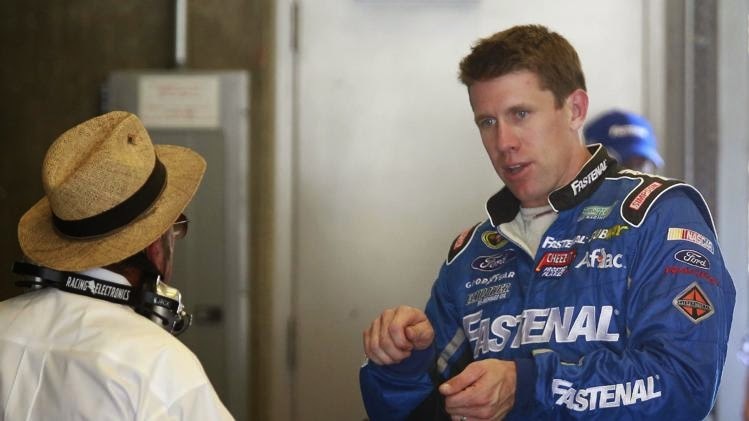 Roush Fenway Racing announced their 2015 Sprint Cup driver lineup this morning and to the surprise of few, Carl Edwards will not be a part of RFR next year and going forward. Edwards is in a contract year and has been rumored for months to be seriously considering leaving Roush, for whom he has raced for since 2003, and especially so after it was announced that Trevor Bayne would be running in Cup full-time next year. Bayne will join holdovers Greg Biffle, who re-signed with RFR, and Ricky Stenhouse, Jr. to comprise the Roush lineup. So why is Edwards leaving? The answer is pretty simple. Roush Fenway Racing is no longer a championship caliber organization, or at least they are not at the moment. And Edwards knows that, given that he has been the only Roush driver to compete for a title in recent years and especially so after he has had a pair of disappointing points finishes these last two seasons (15th in 2012 and 13th last year) since losing the Chase on a wins tiebreaker to Tony Stewart in 2011. Not to mention that Roush is not even the top blue oval organization right now either. That has to go to Penske Racing, whose drivers (Brad Keselowski and Joey Logano) have combined to win a quarter of the season's races thus far and look like contenders to win every weekend at the track, something that hasn't been true this year for Roush (although Edwards has won twice). Meanwhile Biffle sits a disappointing 16th in points with no wins and Stenhouse has also taken a step backwards as he is 28th in points with only four top-20 finishes since finishing second at Bristol in March. Given his the struggles of his teammates and his team's disappointing finishes the last several years, for Edwards to win a title, he will have to go elsewhere and that he is way he and Jack Roush are parting. So where will Edwards land? We will not know officially until after the first of September thanks to a provision in his current contract but all signs point towards joining Joe Gibbs Racing as a fourth car to team with Matt Kenseth, who left Roush after 2012, Kyle Busch and Denny Hamlin. While recent years have found that adding another team could lead to growing pains for any organization, a driver as high-profile as Edwards should not have any issues finding sponsorship. And given how strong of an organization that JGR is, one that has been a consistent title contender for years, it is easy to see why Edwards would want to join up with them. Seeing Edwards drive for another organization will be a little unusual going forward, particularly one that isn't a Ford organization, but it appears to be a necessary move for Edwards to reach his championship potential. UPDATE: Edwards is indeed headed to Gibbs as expected.